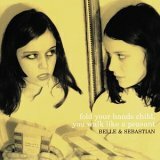 One of the most anticipated albums to be released last year was Belle & Sebastian's Fold Your Hands Child, and while this latest effort initially came across as a bit of a disappointment, it still holds up better than most music on the market. On past albums, the group's songs have always had an eerily familiar ring, but here they stray somewhat from their generally uplifting, hook-laden style. This isn't necessarily a bad thing as it gives the group an opportunity to grow, and several tracks do manage to retain Belle & Sebastian's trademark dreaminess (Nice Day for a Sulk, The Model, Women's Realm), even as they turn quietly subtle. True, there has always been a darkness that has hovered below the surface of the band's ebullient melodies. On Fold Your Hands Child, however, it bubbles to the surface marking an end to the ambience of nostalgic innocence that once graced Belle & Sebastian's albums. Instead, several songs carry with them a baroque somberness not unlike Ray Thomas' contributions to the Moody Blues (Beyond the Sunrise) or the progressive folk rock of Renaissance and Fairport Convention (Waiting for the Moon to Rise). Belle & Sebastian took a more democratic approach to recording Fold Your Hands Child, and this is the simplest explanation for the group's sudden shift in direction. It also provided an opportunity for Stuart Murdoch, the band's shy, elusive leader, to shift a little more into the background. In the long run, this is a good thing for the band. Murdoch is a top-notch songwriter, but variety keeps things interesting and allows for longevity. While longtime fans have complained about the stylistic change, there's no question that the best is yet to come from Belle & Sebastian.